What is the Truckee River Operating Agreement? The Truckee River Operating Agreement (TROA) provides a new approach to managing the Truckee River. TROA took effect in December, 2015 after 26 years of federally–facilitated negotiations, environmental studies and legal challenges. TROA now guides the use of the river from its headwaters at Lake Tahoe to its terminus at Pyramid Lake. The agreement replaces a rigid and inflexible water management system, dictated by decades-old court decrees that were designed to serve farmers, small hydroelectric plants and now-defunct paper mills. Since then, the Truckee Meadows has become less agriculture based and significantly more urbanized. TROA provides for more efficient use of available reservoir storage and allows users to time the releases of water to meet modern-day demands, including the municipal water needs of Reno and Sparks. TROA is intended to increase the operational flexibility and efficiency of reservoirs in the Lake Tahoe and Truckee River basins, thus providing multiple environmental benefits while protecting the exercise of all existing water rights. TROA is able to do this because of two key elements that differentiate it from former operations: 1. the ability of a water right holder, such as TMWA, to exercise a portion of its water rights by storing water that would otherwise have been released from storage or passed through the reservoirs to the Truckee River; 2. the ability to exchange (or trade) stored water between Truckee River reservoirs. Why is TROA so important to our community? TROA allows TMWA to accumulate and carry over stored water through multiple drought years that will, over time, double or even triple the amount of drought reserves TMWA had prior to implementation of TROA. The Reno-Sparks area will be protected from prolonged droughts by increasing TMWA’s ability to store water that it had not been allowed to under pre-TROA regulations. Now that it has been implemented, TROA represents the biggest and most important piece of TMWA’s Water Resource Plan. It also brings an end to historic uncertainty between Nevada and California over distribution of the river’s water, allocating 90 percent to Nevada. When did TROA go into effect? TROA went into effect in December 2015—after 26 years of negotiation. The primary signatories are: Truckee Meadow Water Authority, the State of Nevada, the State of California, the U.S. Department of the Interior and the Pyramid Lake Paiute Tribe. If there was a lot of litigation over river water before, what will stop that now? TROA provides for reduced litigation and continued cooperation by spelling out dispute resolution procedures. Beyond that, the immediate points of litigation were settled prior to the finalization and implementation of the agreement. Are there other benefits to TMWA and the Reno-Sparks Community? TROA gives the community permanent upstream storage for emergency conditions. It also modifies the operation of federal and selected non-federal reservoirs in the river system. Who manages the flow of the Truckee River? While continuing to protect existing water rights under the original 1944 Orr Ditch Decree, the Federal Water Master has primary responsibility for operating the Truckee River reservoir system and will assume responsibility for the administration of TROA. What endangered species are helped because of TROA? Conditions will be improved for the endangered Pyramid Lake cui-ui and the threatened Lahontan cutthroat trout. Paiute Tribe. U.S. Senator Harry Reid of Nevada has stewarded TROA and the related 1989 Negotiated River Settlement since his early years in office. In 1988, Sen. Reid began the process of setting new guidelines for the river that all parties could agree with. Federal legislation was required to incorporate the 1989 Settlement into a comprehensive package to achieve the goals of the five signatory parties. Now, 27 years later, it is finally a reality. Why did the negotiations take so long? The issues the five signatory parties were trying to solve while preserving the water rights of all users of the Truckee River was a complex undertaking. 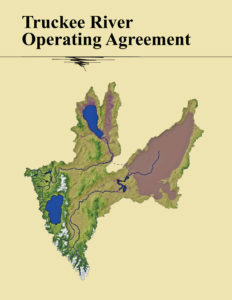 In addition, there were other parties of interests with special viewpoints about the operation of the Truckee River that were incorporated into the final operating agreement: the Carson-Truckee Water Conservancy District, Washoe County Water Conservation District, City of Reno, City of Sparks, City of Fernley, Washoe County, Sierra Valley Mutual Water Company, Truckee-Donner Public Utility District, Placer County Water Agency, and North Tahoe Public Utility District. Litigation concerning the Truckee River – described by some as the most litigated river in the country – went as far as the U.S. Supreme Court. In the end, all had to agree to give up some things to achieve the larger benefits offered by TROA.